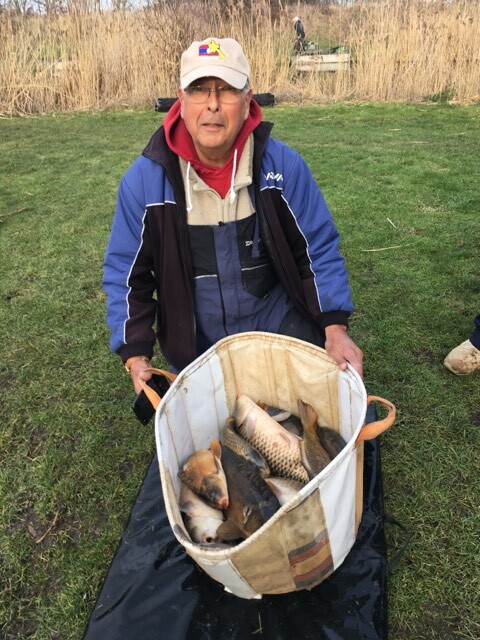 This week’s Over 60’s Open attracted 17 anglers, all in hope of a good draw on the day, to put them on the noted winter pegs on the superb Magpie lake. With the temperature showing a vast improvement on the previous weeks, it still turned out to be a hard day for all but a few, as the fish are still shoaled up in the chosen winter areas. Peg 36 was once again the peg to draw and Brian Yorke took full advantage, putting 99lbs 12ozs on the scales to comfortably win the match. Brian dobbed bread to the lily pads to put together his winning weight. Vic German kept up his fine recent form, taking 29lbs 12ozs from peg 25, with 3rd on the day going to Alan on peg 24 with21lbs 05ozs.